I got these for my 18 month old who was having some angular issues trying to curve his arm enough to get food directly into his mouth with regular kiddie utensils. I figured awesome – you can bend as much or as little as you need to. Well my problem is that 1) they bend way too easily and 2) the amount of food they can hold is pretty much the same as an infant feeding spoon. I thought portion size changed with age a bit? My son gets aggrevated cuz he can barely get any food on the spoon to begin with due to the small size, and on top of that it ends up bending even more while he’s scooping something up. Then it’s over compensated for, and counter-productive. The concept seems good in theory, but I don’t think I would waste my money on them again. These were a great size for my 1 yr old to start eating with. The fork was easily used and really did stab things and get them up to his mouth. The spoon was also a good size. However, kids don’t only use one hand all the time, so I found the good idea of bending kind of silly once executed. Putting them in the dishwasher caused them to become discolored. They are no longer white and blue but beige and faded. 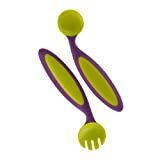 I loved the concept for this spoon and fork set so purchased it for my 10 month old son. A 10 to 11 month old child chews just about everything that he can get his hands on. My son is no exception. He took to the spoon and fork and would chew it from every angle. Much to my dismay, he was able to bite off a chunk of the orange material. This set is NOT safe for the advertised age of 9 months and up. Two stars for the concept. I am returning this product to Amazon.com.